The joys of holiday lights, whether for Christmas or Hanukkah are brightening everyone’s house and dispelling these dark days before the solstice. It brings back memories of one’s youth and happier moments but it also helps unify these new days with them or for some, help rectify them. Sappho opposite Bacchus reminds of us the magic of mistletoe and pine trees and the hope pine trees and joy of holidays will solve that the troubles of the past year. For some that it is true, for others it is just a respite in hunt and time to lick one’s wounds and hunker down before the next attempt of finding a better happiness — at least presumed. Relationships and how they relate to our self-image are out there, and politics gets the same refrain. 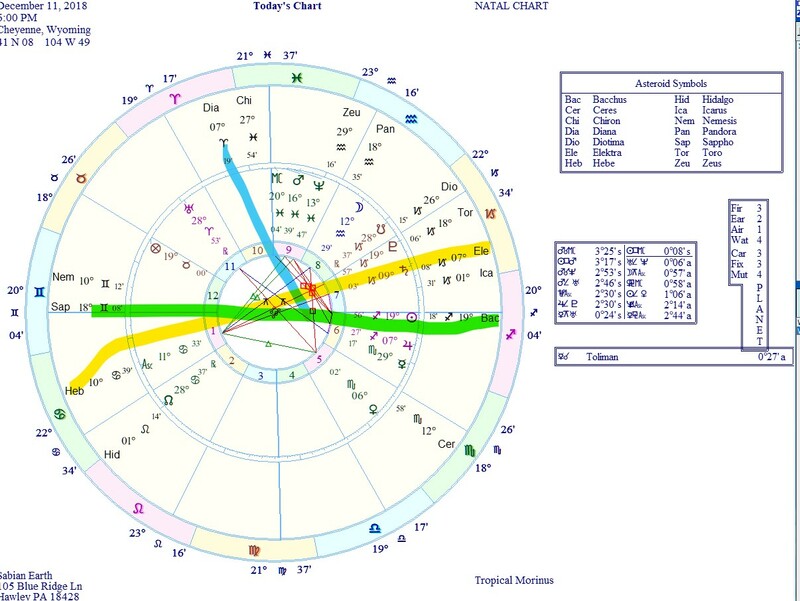 Overall, the week is placid enough except that Diana is on the hunt in the tenth house (and getting some help from Pluto) so that parties can become nightmares and our desire to believe can become our rationale (Nemesis in Gemini). One has to be careful what one wishes for, you may be sowing your own undoing and not embracing the change that is going to come forth whether one wants it not (Toro conjunct Pluto). Cheyenne is the chief city and capital of Wyoming, U.S.A. It is also the county-seat of Laramie county, on Crow Creek, and about 106 m. N. of Denver. Pop. (1890) 11,690; (1900) 14,087, of whom 1691 were foreign-born; (1905, state census) 13,656. Served by the Union Pacific, the Chicago, Burlington & Quincy, and the Colorado & Southern railways, Cheyenne is is situated near the southern boundary of the state, on the high plains near the E. foot of the Laramie range, at an altitude of 6050 ft.; the surrounding country is given up to mining (lignite and iron), grazing and dry-farming. The city has two parks, and is connected by a boulevard with Fort D. A. Russell, an important United States military post, 4 m. north of the city, established in 1867 and named in honour of Major-General David Allen Russell (1820-1864) of the Union army, who was killed at Opequan, Virginia. The industrial prosperity of Cheyenne is largely due to the extensive railway shops of the Union Pacific situated here; but the city is also an important cattle market and has stock-yards. In 1905 the value of the city’s factory products ($924,697) was almost one-fourth the total value of the factory products of the state. Cheyenne, settled in 1867, when the Union Pacific reached here, was named from the Cheyenne Indians. It was chosen as the site for the capital of the territory in 1869, and was incorporated in the same year.